AstroInfo is written by Alice Enevoldsen. Although she works and volunteers for a variety of organizations, the opinions expressed in AstroInfo are her own, not those of any organization. Mistakes in content should be blamed on Alice, not on them. AstroInfo is aimed at an audience of inquisitive adults, and I hope that everyone enjoys it. The writing in these posts and diagrams by me are all available for educational re-use as long as you attribute me, don’t change anything and include a link back, because I want the info out there for people to learn from. So – if you use stuff, let me know, and don’t sell it: I’m not making any money off this. You are welcome to make printouts for your classroom. You can reach me at Alices Astro Info at gmail dot com. Strip out all the spaces and change the at to “@” and the dot to “.”. Comments must be on-topic for the post. If you have a question that doesn’t apply to a specific post, try the “Questions” page. Comments must be polite and readable, but do not have to agree with me. 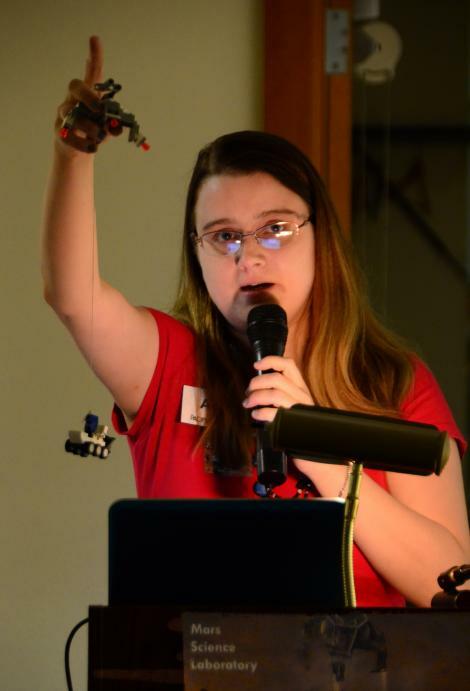 Alice Enevoldsen is a Seattle native and freelance science writer who currently volunteers as one of NASA’s Solar System Ambassadors, and worked in science museums from 1996-2014. She holds degrees in Astronomy-Geology (Whitman College), and Teaching (Seattle University). While at MIT in Cambridge, she discovered a star, now named XTEJ 1837+037, and realized that her calling in life was to work as an educator and teach scientists how to be better educators themselves. You can read or listen to her current work on West Seattle Blog, KOMO Newsradio, Sky and Telescope, and 365 Days of Astronomy. You can reach me at Alices Astro Info at gmail dot com. Here are some photos, videos, and radio interviews I’ve done if you’d like a sample of what I could do for you. Happy to link to you. Now that baseball season is over, I may get around to writing a bit about astronomy on mine! By way of introduction, I visited the Pacific Science Center and picked up some handouts that I shared with the Grout Museum in Waterloo, Iowa. The musum is now on your e-list, and your materials are made available at planetarium shows. In the current AstroInfo I noticed a mention that Altair is the “BEST star in the whole sky.” I am compelled to ask why you say this. Please help me. im becoming a big fan…. i posted last week about stargazing in winthrop – would have nice except for the presence of a bright moon. argggh! headed to whidbey outside of oak harbor next week. how is that for stargazing? I think that should be pretty good! I would like to know if you have any Solstice plans for next Monday. Time, location, etc.? Pizza afterward. Thanks for all you do. I have this pressing need to look up into the sky and see where both Voyager 1 and 2 are. Is there an easy way to find their general location? The JPL site has my head spinning.